We’ve spoke a lot about why we believe Tactical Whey is the most unique whey protein formula ever created. Today, we’re going to explain exactly why it’s a cut above the rest. When Anth first sat down and pondered the creation of a whey protein formula, he had one precondition “It can’t just be another whey isolate - there HAS to be an ‘X-factor’ to the product”. Drawing on his two decades in the sport as a competitve bodybuilder and gym owner, he recognised that we needed to make something that went beyond covering the basic protein needs of athletes. And the realisation was almost instantaneous: bodybuilders - and athletes - are constantly pushing the boundaries of what is physically possible in the quest for greatness. And in this relentless quest for betterment, their body’s break down, become excessively inflammed, injured, and damaged. That’s when we decided that Tactical Whey HAD to solve this problem - and we have. Tactical Whey is fortified with two very powerful, scientifically-backed ingredients that enhance recovery, and support optimal joint, tendon and ligament strength/healing while simultaneously reducing inflammation. It’s the elephant in the corner that everybody ignores in the bodybuilding world, yet it’s the most important factor in allowing you to train consistently and maximise your potential. Get injured, and you’re royalled ‘effed, so to speak. Two ingredients in particular are included in Tactical Whey to support athletes in their recovery efforts in addition to safeguarding them against injuries and excessive inflammation which delays training time. CAVACURMIN® is a highly bioavailable form of curcumin, a biologically active ingredient derived from turmeric. A powerful antioxidant, it’s been scientifically shown to exude incredible anti-inflammatory properties to support joint function. While curcuminoids have long been renowned for anti-inflammatory properties, absorbing them has always been problematic. “CAVACURMIN® consists only of curcuminoids and a safe hydrophilic carrier gamma-cyclodextrin. CAVAMAX® W8 gamma-cyclodextrin is a non-allergenic, vegetarian oligosaccharide. And while CAVACURMIN® obviously has potent benefits for bodybuilders lifting heavy weights that constantly effect tendon and joint quality, it also has another welcome and understated benefit: improving gut health. We’ve all heard the saying “you are what you absorb”, and CAVACURMIN® elicits powerful gut-promiting properties by reducing inflammation in the bowel region, something incredibly overlooked in modern day society. Quite frankly, there’s never been a protein that’s included CAVACURMIN® or a company that’s took such an intelligent approach to whey supplementation, and that’s why we’ve included it in the formula - we’re reinventing the wheel. MSM is a sulfur-containing compound found naturally within many species of plants, animals and humans. It’s also supported by scientific research in its ability to alleviate joint pain, reduce inflammation and even strength the immune system. It is for these reasons, that we’ve fortified Tactical Whey with a further 500mg of MSM per serving - the standard daily dosage to produce demonstrable results to most athletes. MSM has also been shown to inhibit the breakdown of cartilage, a flexible tissue that’s necessary to protect the ends of bones in joints. Every day in the gym is a continuation of the war you’ve raged on your body for self-improvement. Your body would love nothing more than to be a fat, cuddly little winter dumpling with plenty of adipose tissue to survive the harsh winters. Let’s be honest: weight training, at the levels we’re pursuing, is freakishly indifferent to how we’re evolutionarily programmed. We need to take preemptive measures on the battlefield, to support our body’s and tild the battles in our favour. 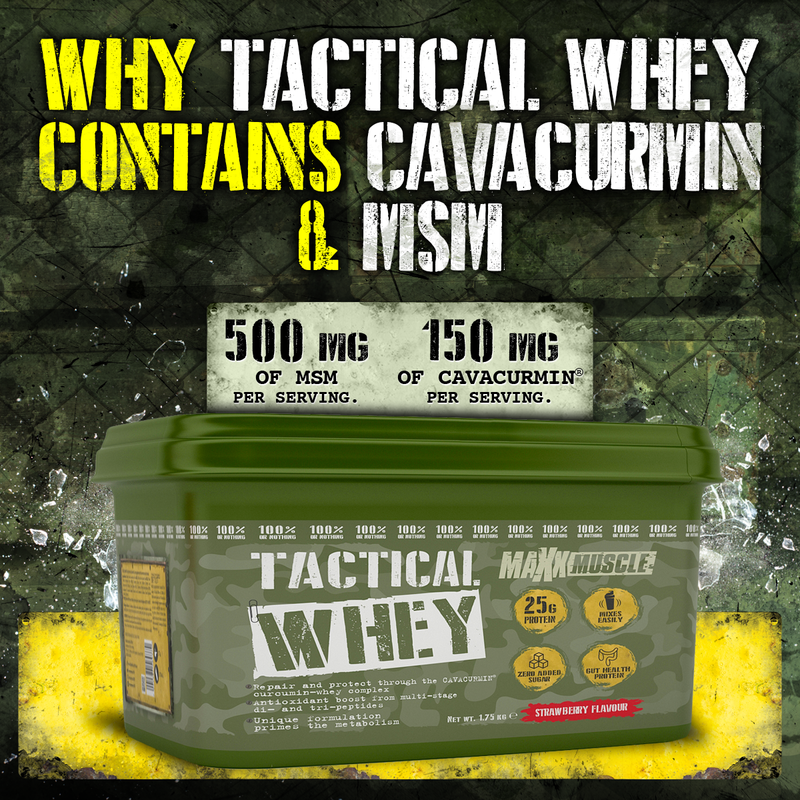 Keep Tactical Whey’s intelligent anti-inflammatory blend of CAVACURMIN® and MSM by your side, and stay in the trenches to see out victory. It’s the only way we know so get to it and put up your best fight.